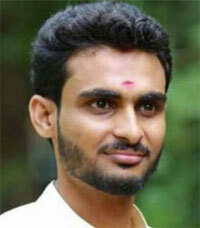 Indian national Naveen T N died in a tragic accident in Kuwait. He was working with Global International, Kuwait. Naveen hails from Palakkadu in Kerala state left behind his wife Rajasree. He was 30 years old. He was on his way to duty near Fahaheel and the vehicle he was travelling overturned. My heartfelt condolences to the family & friends..
Heartfelt condolences to the bereaved family. may his soul RIP! Amen! we really miss such a good man. Heartfelt condolences. May Almighty God give enough courage to the bereaved family members to overcome the irreparable tragic loss! May his Soul Rest in Peace! May God hive courage to his family members to overcome such a irrecoverable loss to his entire family. Heartfelt condolence, irreparable loss for family. Request to all careful in driving. Your family waiting for you. May His soul Rest In Peace.may his family accept Gods will. OMG May his Soul rest in peace and give patience to his family members.